A photographic primer on the dynamics of marine ice. In the era of climate change, ice is a hot topic. It makes headlines for calving, drifting, and melting in the polar regions at alarming rates. But what is marine ice exactly? The ocean’s ice comes from either the atmosphere or the sea itself. Glacial ice (which can cover vast areas, including Antarctica) originates from precipitation, while sea ice (also vast, depending on the season) forms when the ocean freezes. Ice dominates both polar regions but in different ways. 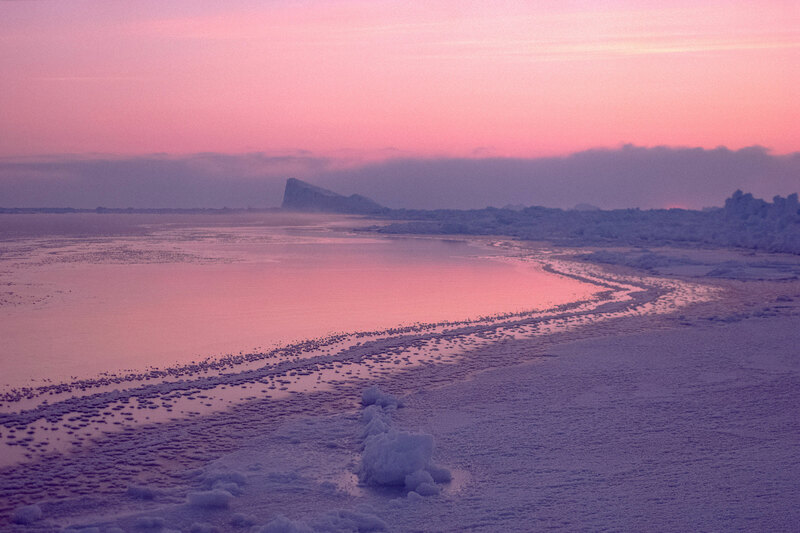 The Arctic is a frozen ocean surrounded by land. 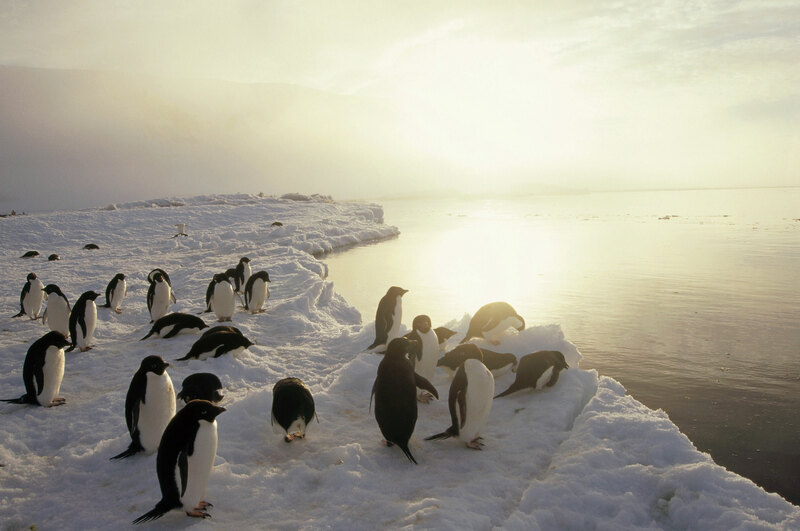 Antarctica, by contrast, is a frozen landmass surrounded by ocean. On a visit to either, your ship might bump through sea ice, but you would likely take more photographs of glacial ice because it’s responsible for icebergs. Sea ice, matte white and typically no thicker than the height of an average person, is less glamorous—unless there’s a polar bear standing on it—but just as remarkable. It’s a critical habitat for a range of species, from single-celled organisms to whales. And its dynamism is amazing; much of the world’s sea ice disappears and then re-forms every year. Antarctica is the highest, in average elevation, of any continent on Earth due in part to the ice sheet that blankets it with an average thickness of two kilometers and a maximum thickness of almost five. The continent has been at least partially covered in glacial ice for 40 million years, and the oldest ice that scientists have been able to extract holds gases from the Earth’s atmosphere 2.7 million years ago. 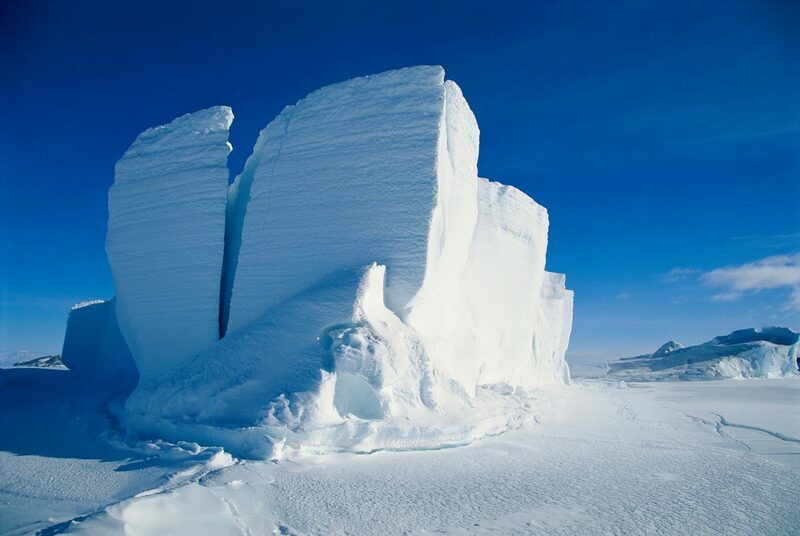 Antarctic ice is often described through monolithic metrics like these, but that vast expanse of glacial ice began as flakes of snow. Snow compressed by its own weight becomes ice, and when enough ice accumulates in one place, it begins to slowly flow across the landscape and becomes a glacier. 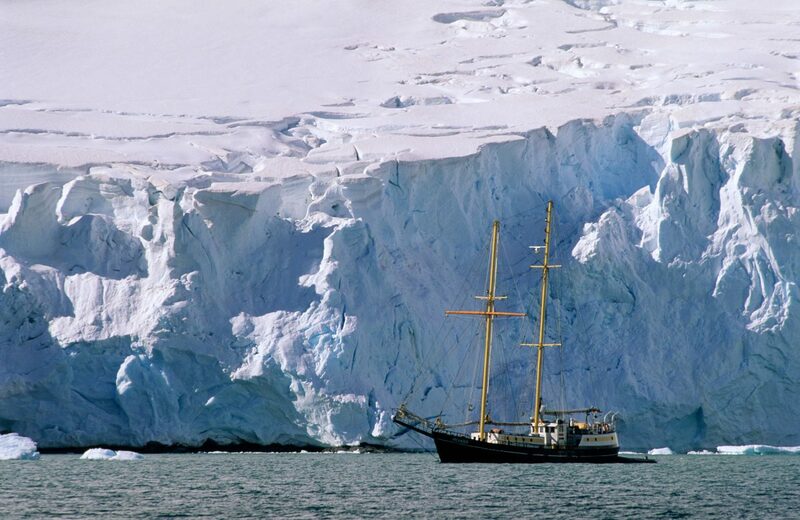 If glaciers reach the ocean, they float and may extend hundreds of kilometers out to sea as ice shelves. 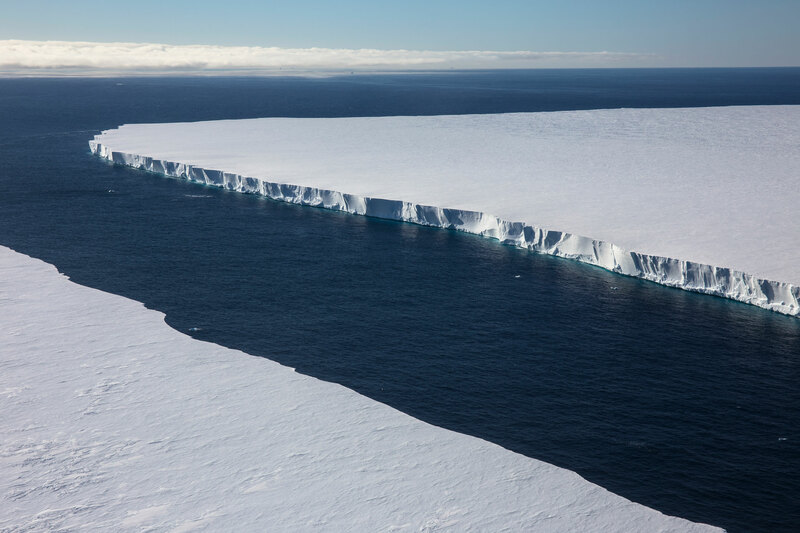 Some ice shelves have calved dramatically in recent years—an iceberg almost half the size of Prince Edward Island broke off a shelf in Antarctica in 2017. Ice shelves can help stabilize glaciers, keeping them on land; without them, land-based ice may flow into the sea and deteriorate more quickly. If all the glacial ice in Antarctica were to melt, it would raise the global sea level by 60 meters—high enough to submerge a 20-story building. 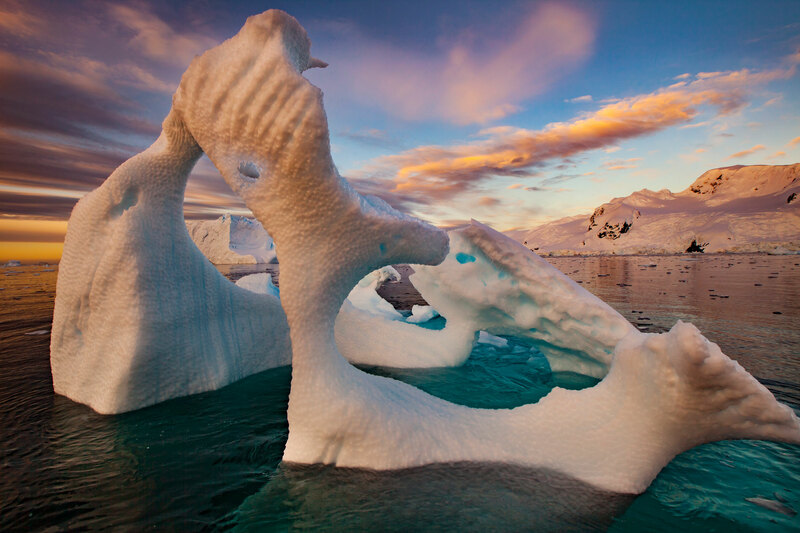 In the Arctic, the Greenland ice sheet holds enough water for six meters of sea level rise. 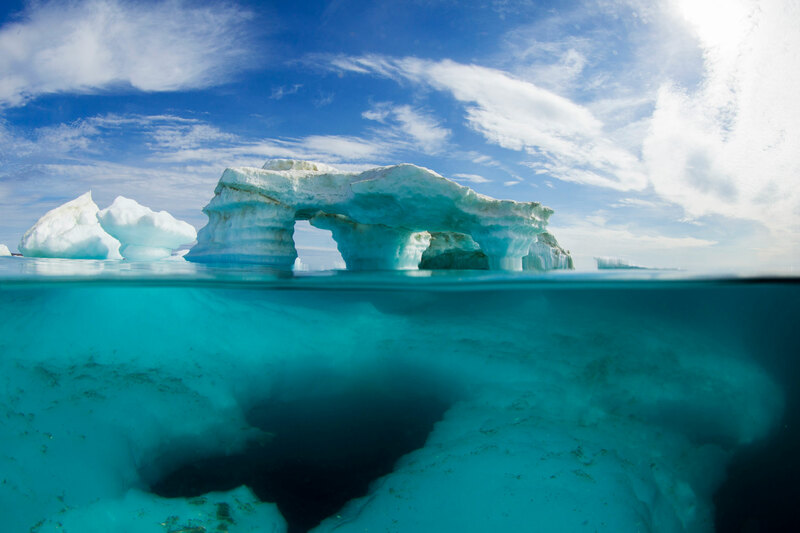 Icebergs—bits and pieces of glaciers or ice shelves—come in all shapes and sizes, from tabular bergs to arches and forms that could have been drawn by Dr. Seuss. A lot of sculpting happens through erosion, as the chunks swivel and flip in the sea. While glacial ice can have a big impact on the ecosystems around it by decreasing salinity, adding nutrients, and changing currents, there isn’t much living in or on the ice itself. Sea ice is another story. Unlike freshwater ice, sea ice begins as a thin, malleable sheet called frazil ice, which then progresses through a variety of stages including shuga (spongy lumps a few centimeters across) and nilas (a thin, elastic crust). The process starts when seawater reaches its freezing point, which varies with salinity and is about -1.8 °C in the polar regions. Salt itself does not freeze; as the ice forms, salt molecules are largely excluded from the crystals. As a result, sea ice is not nearly as salty as the sea itself. Gravity helps pull the discarded salt molecules down through the ice, leaving small, vertical tunnels called brine channels. 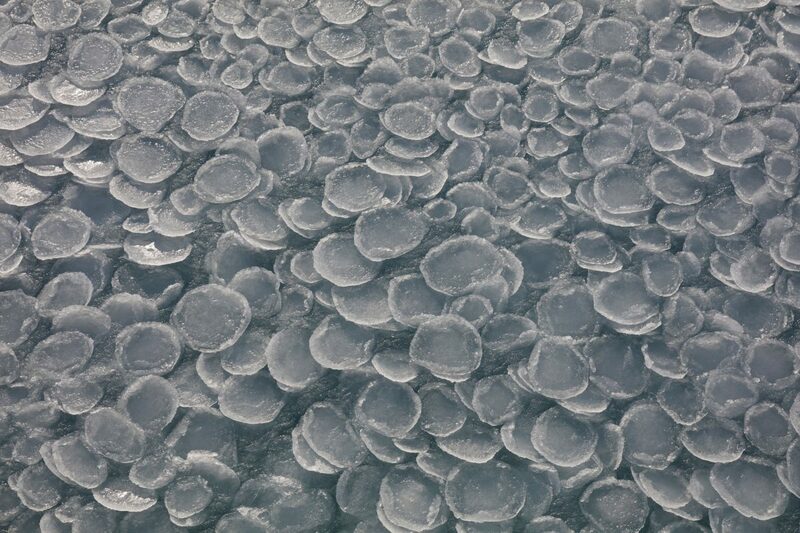 Before sea ice solidifies, it may become pancake ice, a beautiful mosaic of circles ranging from the size of a Frisbee to a backyard trampoline, with raised edges formed from the constant contact between the pieces. 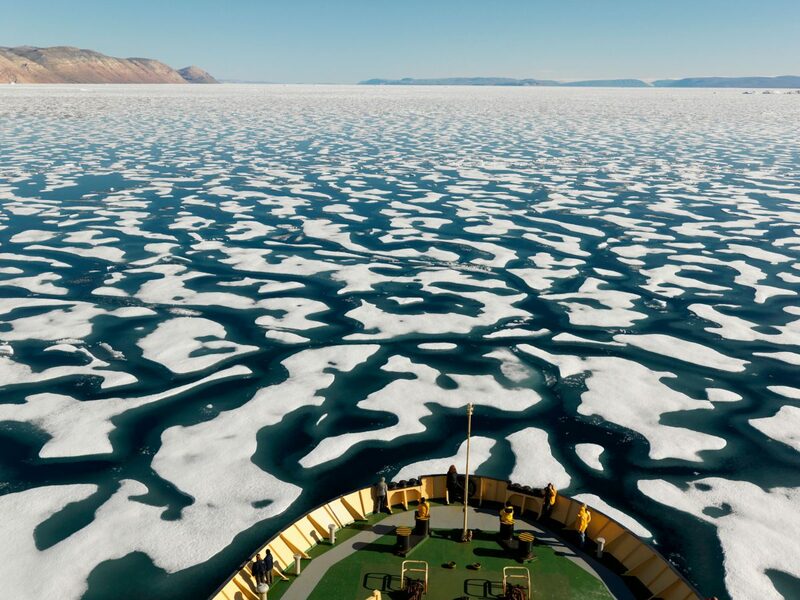 Because sea ice is so varied and of such concern for ship traffic, mariners have precise navigational terms to describe its different forms, including young ice, gray ice, gray-white ice, thin first year, and thick first year. Salt molecules extruded from sea ice form a dense, hyperchilled brine that can sink rapidly through the water after trickling out of the ice. 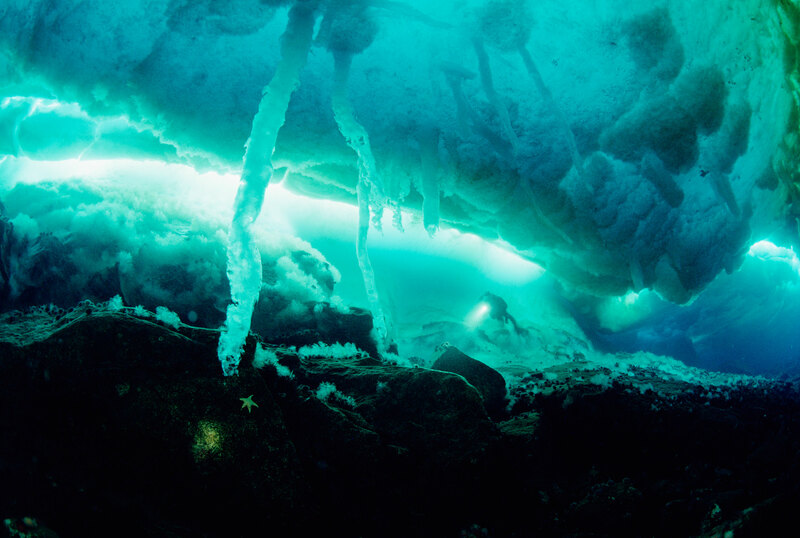 Because the brine is colder, the subsurface seawater it comes in contact with sometimes freezes upon contact, creating an underwater icicle—or brinicle—that extends toward the seafloor like a slow-growing lightning bolt. 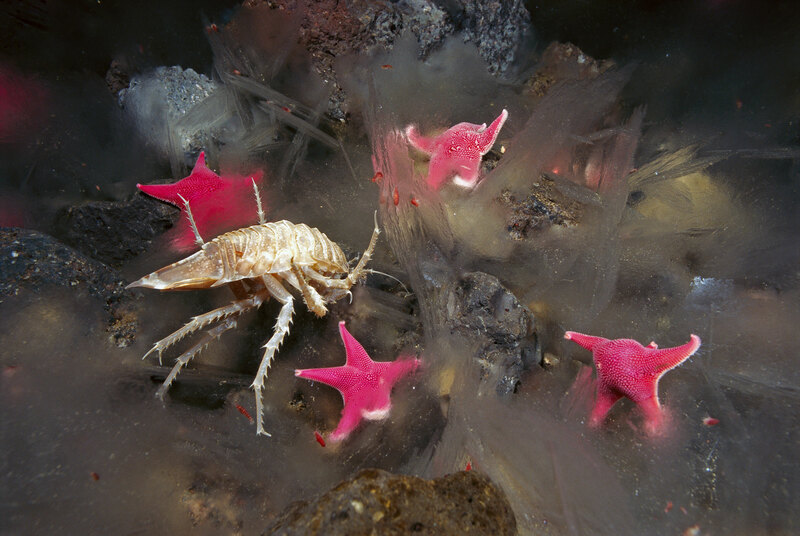 Anything the icicle touches can freeze to death, including these unfortunate sea stars and giant Antarctic isopod. The salty brine that flows out of sea ice is also a habitat in itself. After one year, sea ice has almost no salt left in it, but during the extrusion process, when brine is flowing, small organisms such as copepods, nematodes, rotifers, and flatworms can find nutrients and a dearth of predators in the brine channels if they can survive the extreme microhabitat—under the ice, near freezing, super-saline, and temporary. First-year sea ice makes up most of the sea ice in the world, both north and south. Enough forms around Antarctica each fall to almost double the surface area of the continent, yet the majority of it melts the following summer. In the Arctic, multiyear ice is more common; the Arctic Ocean always remains partially frozen. In early autumn, the region reaches its annual sea ice minimum. For the past 20 to 30 years, that minimum has decreased by an average of 45,000 square kilometers worth of ice each year. Sea ice is the defining feature of the Arctic Ocean, yet as more of it disappears, the ocean is transforming from a solid to a liquid. 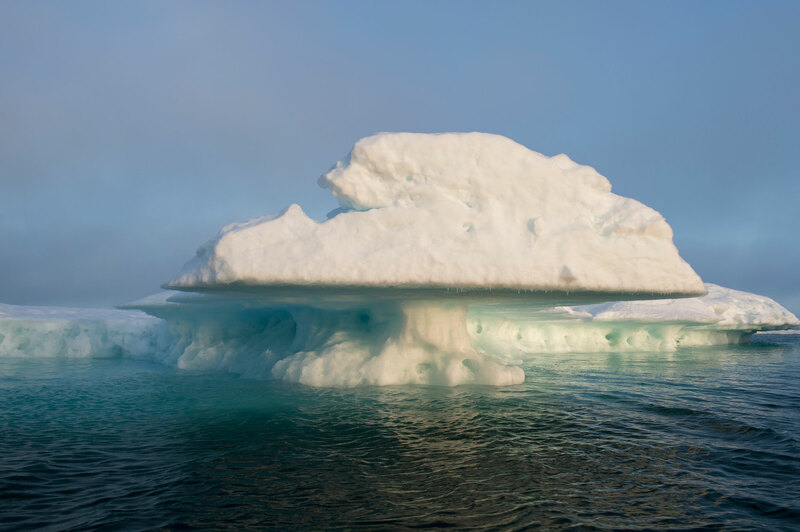 In spring, when the light returns and ice begins to break up, photosynthetic organisms bloom across the underside of the sea ice, effectively re-energizing the food chain. Zooplankton feed on this plant life and in turn become food for various fish species. Everything from ringed seals and bowhead whales in the north to leopard seals and Adélie penguins in the south benefit from the burst of life. Polar bears are unable to catch seals, their primary food, in open water, so they depend on sea ice as a hunting platform. Ice is especially critical for the bears between early April and mid-July, when they take in two-thirds of the energy they need for the year. Later freeze-up, earlier break-up, and less ice overall may cut weeks off this important window, with wide-ranging consequences. For example, in northeastern Hudson Bay and Hudson Strait, there has been a sevenfold increase in the incidences of polar bears feeding on eider duck and murre colonies since the 1980s, as hungry bears are forced to look for alternative sources of food. The occasional whale or walrus carcass may provide additional sustenance, yet polar bears will not adapt to a terrestrial existence. 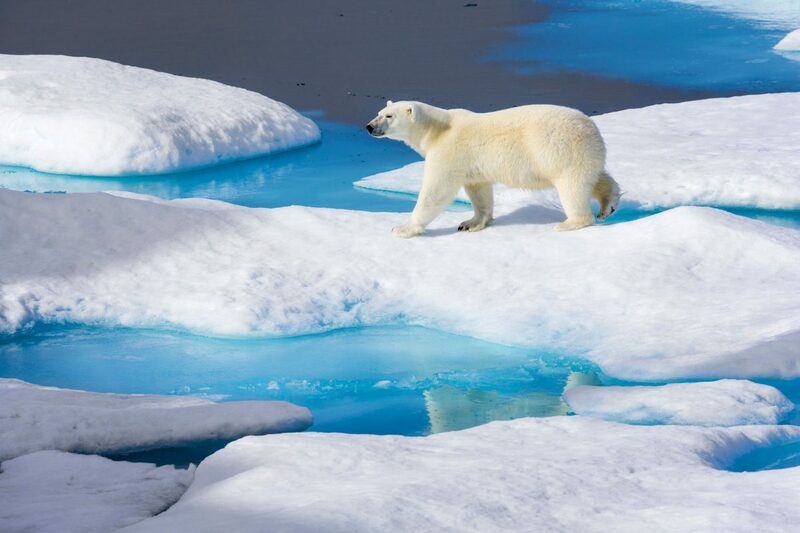 The species needs sea ice to survive. For many of the four million people who live above the Arctic Circle, sea ice has been a highway and a hunting ground for thousands of years. Today, that important terrain is changing or disappearing. The timings of freeze-up and break-up have changed and so have the thickness and quality of the ice. This threatens food security and directly impacts the safety of those who must venture across the surface. Glacial ice may tower over sea ice, but during winter, when the ocean changes state, sea ice encircles icebergs, freezing them in place. This interface between the two types of ice opens new possibilities for those who know ice best. In the Antarctic, crabeater seals use gaps between the two ice forms to haul themselves out. 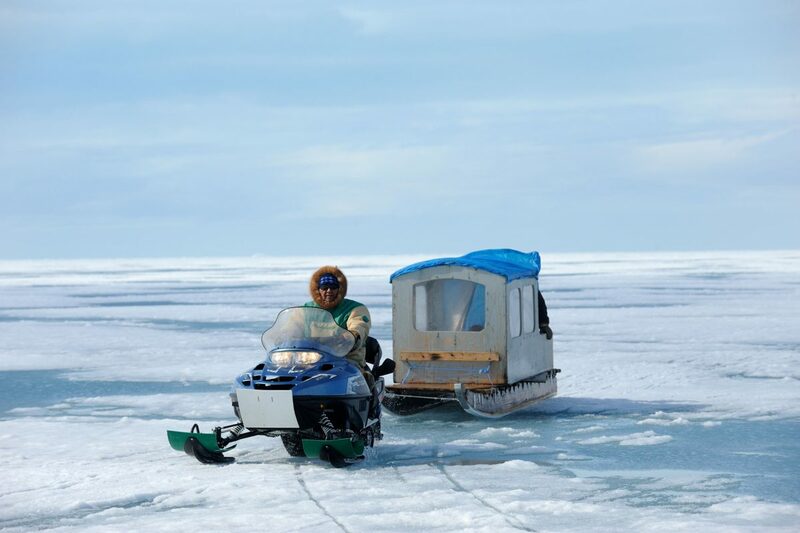 In the Arctic, people cross the sea ice by dogsled or snowmobile to harvest chunks of icebergs for their tea water. Ice defines life in unexpected ways. Jennifer Kingsley is a journalist based in Ottawa, Ontario. She is the founder of Meet the North, a project that shares personal stories from some of the four million people who live in the global Arctic, and she also works in the South Pacific. 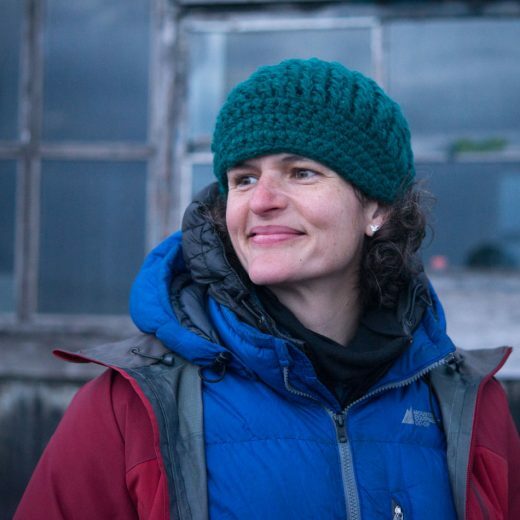 Jennifer is a National Geographic Explorer, and her first book, Paddlenorth, won the National Outdoor Book Award. Cite this Article: Jennifer Kingsley “Frozen Ocean,” Hakai Magazine, Sep 24, 2018, accessed April 26th, 2019, https://www.hakaimagazine.com/videos-visuals/frozen-ocean/. The role of the sea in melting the Arctic.